What is this 1-to-1 curriculum all about? 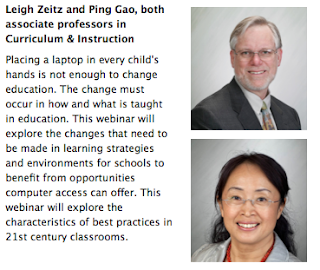 Dr. Ping Gao and I will have an opportunity to share our ideas about Curriculum for the 21st Century with you in a Webinar that we will be giving on April 26, 2012 at 4:00 CST. We will be discussing the need to rethink how education should be framed and explore some tools for making the changes. Here are some links to the resources we have shared. If you don't find something important here that you think should be included, just add it in the comment section below. Watch our hour-long webinar. We have participants from Oklahoma, Arizona and around Iowa. 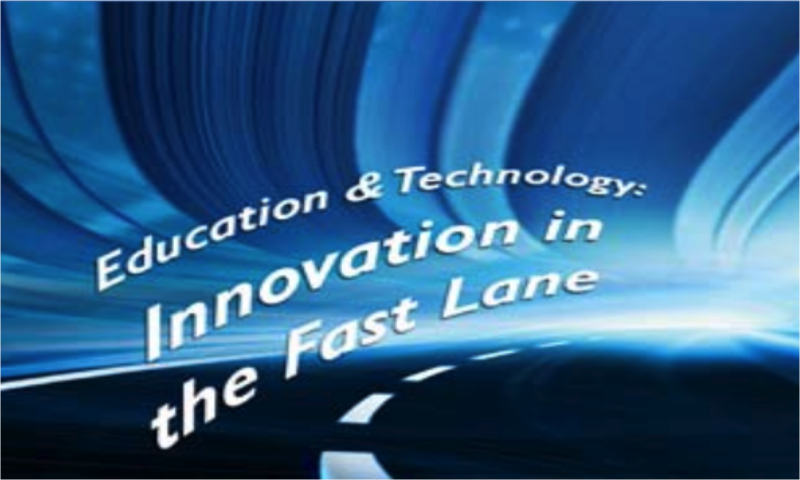 21st Century Video - Greg Whitby talks about the curriculum DNA. Van Meter Social Media - Interview with students about how they have used Social Media in their learning. Iowa Universal Constructs - The universal constructs identified following an analysis of the competencies and habits of mind needed for future successes in careers, college and citizenry. Technology Integration Matrix - Florida Technology Integration Matrix creates a 25-cell table that integrates 5 types of Meaningful Learning Environments (Jonassen et al) with 5 levels of Technology Integration (Apple Classroom of Tomorrow). Filled with 100 short videos of best practice examples for Math, Science, Social Science and Language Arts. TPACKing for a Wild Learning Trip - This is a link to a resource page that I created for my students when they were studying TPACK. 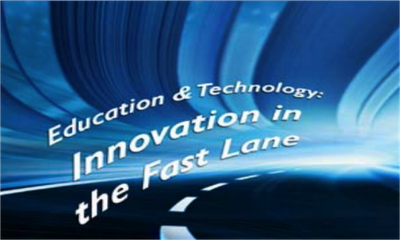 It is filled with a plethora of resources about the Technological, Pedagogical and Content Knowledge (TPaCK) model. Exceptional book where a school administrator chronicles his many adventures while directing a school into a 1-to-1 paradigm. Must read!!! 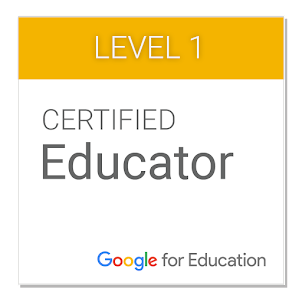 What ideas or accomplishments or resources would you like to share about 1:1 curriculum? Please share them in the comments section below. Laptops After Hours . . .
What do our laptops do when we leave the room to go home? Here is a short stop-action video that was created by some students at Wartburg College in Waverly, Iowa. This story, Two Laptops: A Conversation, is about a couple of laptops discussing the implications of being energy conscious. My favorite part was when they left their work room and then moved over to the computer lab where they sat in chairs to work on desktop computers. Really? Computers are spending their off hours working on other computers? We geeks REALLY need to get a life. I hope that you enjoy this as much as I did. What do you think? Have your students watch it and then respond. Are you looking for a way to bring excitement back into your students' writing? Has writing become a process that no longer is attractive for your students? Have them write scripts for their Blabberized pictures. Doesn't matter if they are people or animals or Martians. Blabberize.com is a site where you can upload a photo and create settings that will enable the mouth to move. All that you do is upload the photo/picture. Identify the area that you would like to have move when you create the animation. Here's a hint. 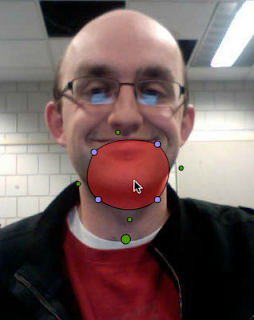 It works best if you pick the whole lower jaw so that it looks like your character is really talking. Looking for a quick video on how to Blabberize? Here is one made by one of my students. How do you use Blabberize? Can you direct me to an interesting collection of unique blabberized pictures? Please answer in the comments below. What a wonderful opportunity to speak to the IACON conference in Altoona, Iowa. Today, I am going to be talking about how we can engage our students using many of the tools that we have online today. You should be able to find the tweets using this hashtag by clicking here. View more presentations from Leigh Zeitz. This are blogs that contain multimedia resources that are to be reviewed and used for the various modules for classes. We have the privilege to join Iowa's leading educators at the 1-to-1 Institute. This is the third year for this event. It has been a great success. This year I believe that there are over 1,000 attendees. We have a whole team of UNI folks who are sharing their ideas. Using QR Codes in the Elementary Classroom - Joshua Mitchell, Nelson Rokke, Robin Galloway and Dr. Ping Gao. Here's the schedule for the conference. I will be sharing my ideas about how improving education will require much more than just buying hardware for students. Here is my presentation along with some links to the resources that I discuss. If you have any additional resources, just add them to the comments down below.